Located on a tiny street off of Passeig de Gracia, is a Bodega and Italian Restaurant, worth a visit. Raffaelli was founded by Sandro Raffaelli, an Italian entrepreneur with long experience in the world of catering. Sandro has a successful track record in the creation and management of venues, pizzerias and cocktail shops in Italy. The Raffaelli family came to Barcelona after Sandro fell in love with the Catalan capital. He and his two daughters Greta and Gioia have a passion for the Italian gastronomic traditions. 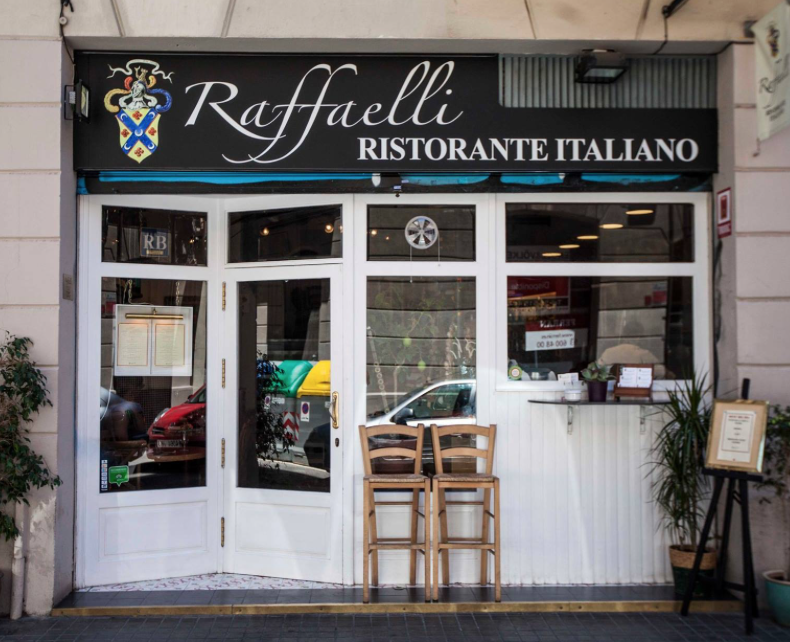 Together the family of three started Raffaelli, to give the Barcelona community an authentic and elegant Italian restaurant. We think Rafaelli’s has the best fresh pasta and Italian cuisine as well as an extensive wine list. With their talented team of creative and young professional that are the best hosts, and make you feel 100% comfortable during your dining experience. While dining, you can choose one of three areas to enjoy your meal, Gioia, a fresh and informal dining space is ideal for groups of friends and family outings. Viola; the main dining area is a more intimate experience for date night; it is warm and quiet and feels very private. Finally, Grete is a private room you can reserve for special occasions like family gatherings, business events, and celebrations. The variety in the rooms and menu options is the perfect mix of avant-garde and tradition suitable for anyone. Located just off to the side of this fabulous restaurant is Enoteca Raffaelli also owned by Sandro. The enoteca has begun a new project after meeting with Riccardo Giamminola a curator and journalist in Mirandoelarte. The two found similarities in their passion for wine and art; two sensory experience that pair perfectly. Together they began the “EmbriagARTE” project. Where they combine their efforts to create a space for stimulating senses with a glass of wine and beautiful art. They invite you to check out their space and share their passion with them. This project materializes at Antunez street, nº 9. Be sure to check out the project here!